Absolute Games is an Indie game developer, his first game is Assault.A great game, that will bring you closer to favela and gang life.Great story that will entertain you and your friends at all time.Somebody call Assault a gang simulation, we call it a gang story. Absolute Games goal is to entertain all people that love FPS game, and people that love a great story. On the game are working a lot of indie developers around the world that have passion for making games and also passion for playing great games like Assault. Assault is really a cool and great game, but that only the half of the story. Assault has a story that will make you cry or make you laugh, who knows. Story of the game will show you amazing sites of favelas and amazing gang fights that will just blow your mind. It has a lot of features like : Favela Explore, Hidden Stash Feature, Shops Feature and a lot of amazing features that you will be available to play next year ( 2014 ) . ETeeski : Youtube.com( old demo ) Contact us or ..
2013 Retrospection of Assault Updates and its best moments ! This video will show you all the updates in 2013 and its all best moments and it will show you plans for the future ! Hope you enjoy the video ! 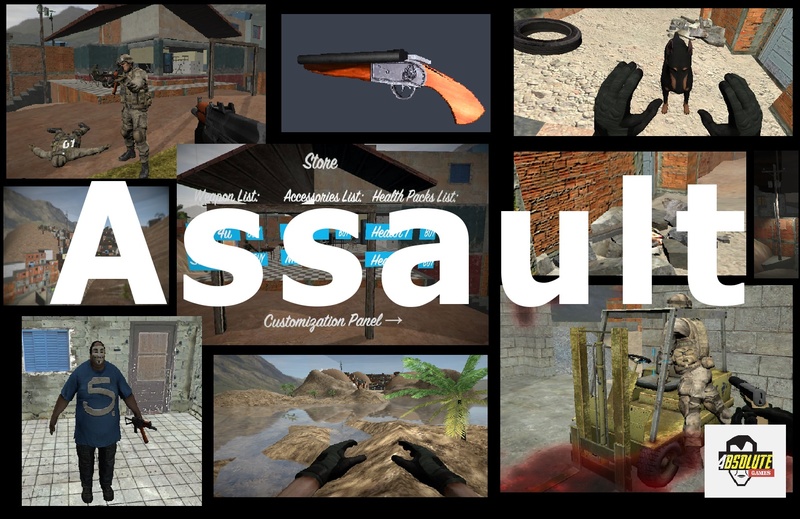 Please subscribe, like and share !Previous Assault Updates : Youtube.com Games on Facebook : Facebook.com : Youtube.com Games on IndieDB :https://www.indiedb.com/company/absolute-gamesAssault on IndieDB :https://www.indiedb.com/games/assault-by-absolute-gamesSong Credits/Notes:Song used in the video as background music aren't made by Absolute Games, the songs were made by they creator, we don't take any right for the music !PS. The songs are copyright free ! Hey guys finally the Long Awaited Update, Update #9. Assault(Absolute Games) Update #9-Swimming,Pedestrians. Assault Multiplayer Screenshots : " Team Meeting"
Where can i get the demo? So is this supposed to be like Postal? no this isnt supposed to be like Postal, this is just the multiplayer, search more about us any you will see the single player ! I fail to see how it would be a mistake, you lose nothing by doing it so thank you, I take it that it's still a long way from any release yet? Cool okay, I take it you will be doing Alpha and Beta's before the actual release and having some sort of pre-order system. Actually we are already released a demo for windows only. But if you want i can upload a Linux demo for you, so you can test the game ? Sure would love to try it out. Assault back in development... Want it? PAGE SHUTTING DOWN IN ONE WEEK.